Lightweight versatility. Being a double, it had to weigh less than 20 pounds, with ease of opening and closing. Vertical seating instead of side-by-side seating to allow for navigation through narrow spaces and doors. Ample cargo room. Storage for mom and baby things (cup holders, phone pocket, undercarriage storage). Affordable. Need I say more? After a couple test runs at different stores, I selected The Joovy Caboose as the clear winner and my pick for the best double stroller available. 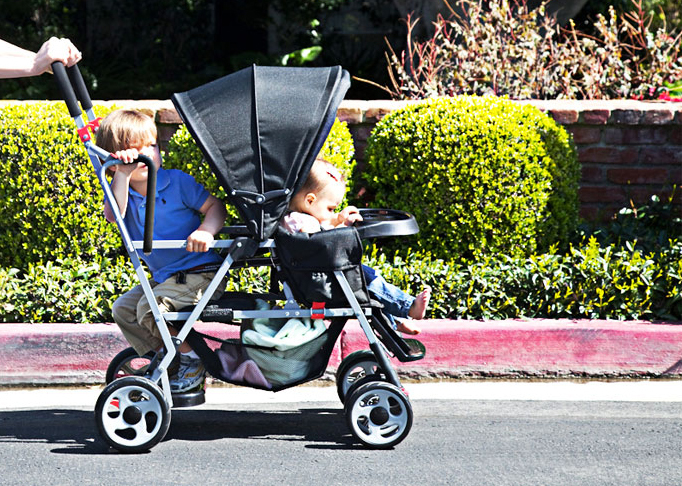 In fact, Joovy’s simple frame and portability often attract many positive comments and inquiries by moms whenever I’m out with the boys. With my sons being three years apart, the Joovy Caboose was the perfect tandem stroller, allowing a toddler to sit or stand and the ability to attach an infant car seat without dissecting a mini manual. (Seriously, who has the time?) The price point was also a big draw; let’s face it, there are many marvelous strollers, but they generally start at $800 and up. I certainly did not want to invest in a super expensive piece that my toddler may quickly outgrow. The standing option on The Joovy Caboose also affords my older son some independence with the flexibility of sitting or standing like a “big boy.” There’s also versatility for my younger son, with the universal car seat attachment system and roomy front carriage seating that adjusts to his growth. I also love the large undercarriage storage compartment, multiple “mommy” storage pockets, ease of steering, and the extended canopy for both rain and sun protection.